learning activities that reinforce mastery of concepts taught. Each course can be completed at the learner’s leisure, from any computer, at any time. Learners may pause and resume the course at the precise page they stopped. Certificates are awarded for each course completed (Discounts are available for Condominium Boards or Property Management Companies by calling us at 1-800-521-9667). This suite provides 10 hours of training. 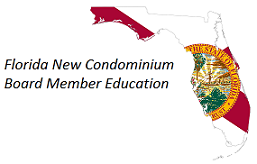 The Human Equation, Inc. has been designated an Approved Condominium Education Provider by the Division of Florida Condominiums, Timeshares, and Mobile Homes (“Division”). This suite of courses has been designated an approved educational curriculum by the Division. A copy of the Certificate of Completion for each and every course in this Suite must be provided to the Secretary of the Association so they can be retained and made available for inspection as required by law.